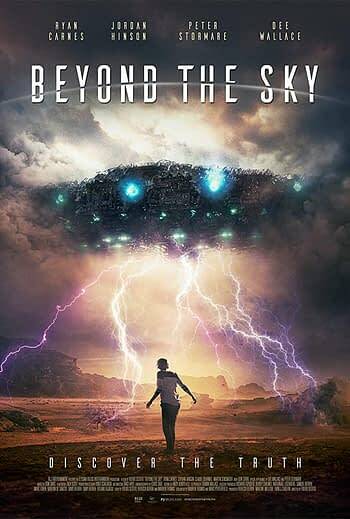 Bleeding Cool has received an exclusive preview clip of RLJE Films’ upcoming sci-fi thriller, Beyond the Sky in theaters and On Demand / Digital HD on September 21, 2018. In the film, Chris Norton (played by Ryan Carnes) has been hearing about alien abductions his entire life but, in his gut, he knows they are not real. Setting out to disprove the alien abduction phenomenon once and for all, he attends a UFO convention to meet alleged abductees and reveal the truth behind their experiences. It is only when he meets Emily, who claims to have been abducted every seven years on her birthday, that Chris realizes there may be more to these claims than meets the eye. With Emily’s 28th birthday only days away, Chris helps her to uncover the truth as they come face to face with the reality that we are not alone. Beyond the Sky stars Ryan Carnes (Letters from Iwo Jima, Doctor Who, Desperate Housewives), Jordan Hinson (Eureka, Kevin From Work), Peter Stormare (Fargo, Prison Break), Dee Wallace (E.T. the Extra-Terrestrial, The Hills Have Eyes), Martin Sensmeier (The Magnificent Seven, Westworld) and Don Stark (Star Trek: First Contact, That ’70s Show).